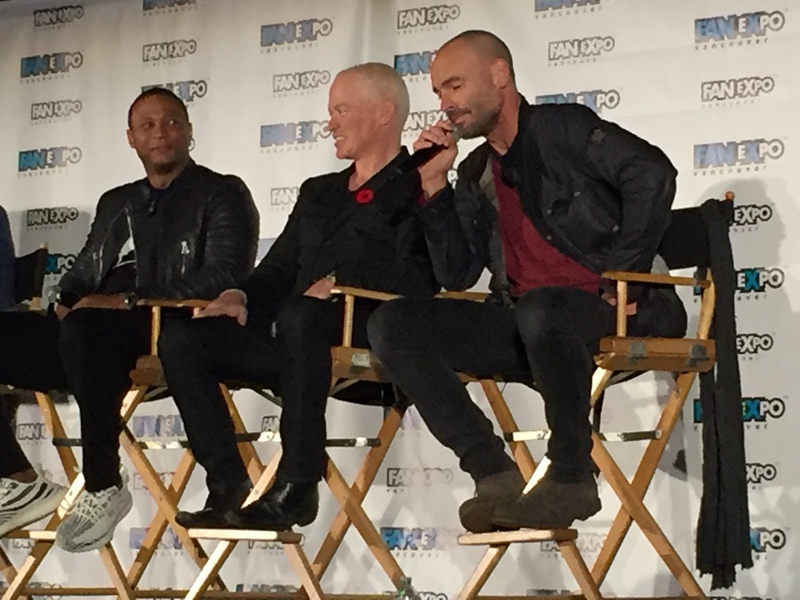 The stars of Arrow and Legends of Tomorrow graced the Fan Expo Vancouver stage this past weekend to talk about the show and was a bit more on the upcoming 4-way cross-over. And even though McDonough isn’t on the show anymore, he said that he misses being on Arrow. However, McDonough added he is having a blast on Legends. ” [on Arrow] Damien was serious in tone and Legends it is goofier and fun,” he said. Ramsay said that this season of Arrow sees the show return to form and has a mature Oliver listening to people and we will see a side of Diggle that no one has seen before. And since Diggle is now the Green Arrow, Ramsay mentions the suit is three layers of leather and always ends up in bucket loads of sweat when he takes it off. Ramsay also thought it would just be one episode where he suits up as the Green Arrow but once he saw the show was making him a crossbow, he realized it would be longer. Arrow suit is three layers of leather. Thought one episode as Arrowen head getting crossbow, realized longer. “[Diggle being the Green Arrow] was the Dominators’ vision of Diggle’s perfect life and in the future his son is the Green Arrow. There is a lot going on with the mythos and we are not done with it yet,” he added. Since Bruce Wayne was named dropped this season, Ramsay would love to see the two billionaires (Bruce Wayne and Oliver Queen) duke it out. “I think it would be interesting to see Oliver through Bruce Wayne’s prism.” Ramsay also wondered which Bruce Wayne we would see the grizzled old man or the League of Assassins Bruce Wayne. The men also talked about series star Stephen Amell and how the actor leads by example and how that trickles down. Finally, on the topic of representation on television, Ramsay pointed out that Greg Berlanti is to thank for the diversity we are seeing on the Arrowverse.